This list was compiled by the Kennel Clubs, an organization comprised of many dog trainers and dog owners, so it does represent opinions from both sides of the equation. It is based on learning ability, in terms of speed and accuracy, for how many repetitions it took for a certain breed to master a new command. All breeds on this list took at least 5 repetitions or less to learn a new command, and tended to obey first commands more than 95 per cent of the time. This is better than many people – how many times have we seen it take a lot more than 5 reps for someone to learn something! This breed was developed in Australia in the mid to late 1800′s to be a silent worker able to control livestock in wide-open spaces as well as in the stockyard. 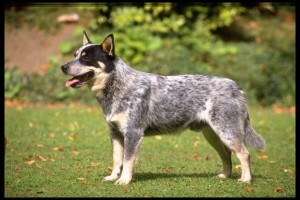 It is believed that the breed was developed using the Native Australian Dog (Dingo), the Dalmatian, the Bull Terrier, and the Australian Kelpie, among others. Their personality traits include the ability to think and make decisions, strong work ethic and an intense sense of loyalty and protectiveness to their property and masters, and a needto be around the people he bonds to. The history of the Rottweiler is not a documented record. 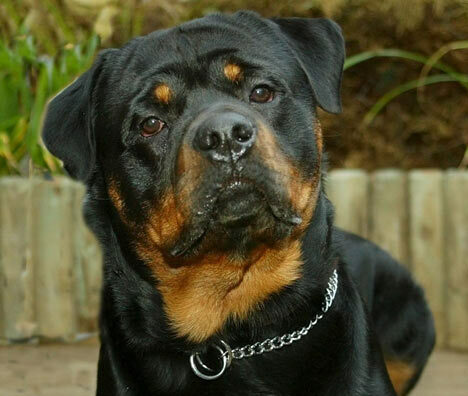 There is the likelihood that the Rottweiler is descended from drover dogs indigenous to ancient Rome. These drover dogs were described as being of the Mastiff type, with great intelligence, rugged, dependable, and willing to work and with a strong guarding instinct. The transition from Roman herding dog to the dog we know today is attributed to the Roman Emperors, who brought along and trained the dogs as they brought their armies to conquer Europe. In 1910 the Rottweiler was officially recognized by the German Police Dog Association as the fourth police dog breed. The period from 1882 to 1910 saw the breed go from obscurity to national acclaim. Though highly intelligent, the Rottweiler can also be quite vicious if its territory or master are threatened. It is this sense of protectiveness, along with the strength and to follow through, combined with courage and reliability that have made this breed a top choice for guard dogs. This may look like a cute little lap dog, but aside from its intelligence, it is also tough and protective of its home turf. 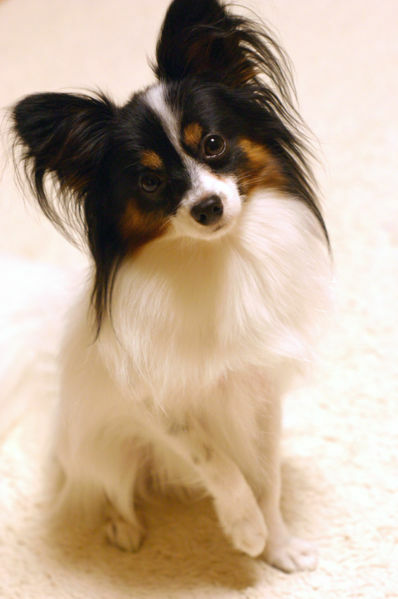 Once a favorite pet of French and Spanish nobility, the Papillon is thought to have originated in Italy. The Papillon breed type has remained true for more than 700 years, and this unique breed has been portrayed in works of art dating back at least that long. The Papillon is a great choice for elderly or disabled dog owners, since it’s exercise needs are minimal. The Papillon dog breed is well suited to apartment living and city life. The Papillon makes an excellent family pet for any size accommodation and is ideally suited to the stay-at-home. The Papillon is easy to train and grows to be very affectionate to its owners, but this bond takes time to develop. Originally from Newfoundland, the breed was initially used to haul fisherman�s nets to shore. Specimens were brought to England in the 1800�s by ships coming from Labrador, the place where the breed�s outstanding retrieving instincts were honed and developed. 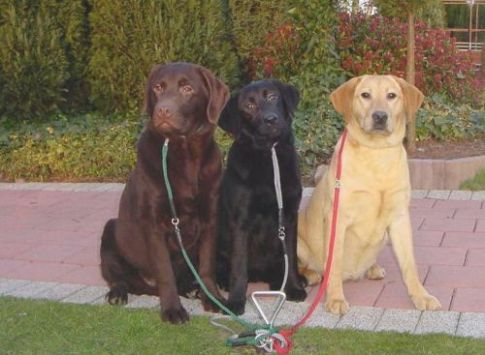 As a breed, the lab is a favorite choice for the “family dog” due to its obedient, loving and patient nature. It is typically affectionate towards both other dogs and people – children in particular – in addition to being a very smart dog. They also love to exercise and run about, which makes them perfect as pets for families with children who want an active dog to play with. In 2009, Labrador Retrievers passed the Golden Retriever in the American Kennel Club�s list of the most popular dog. 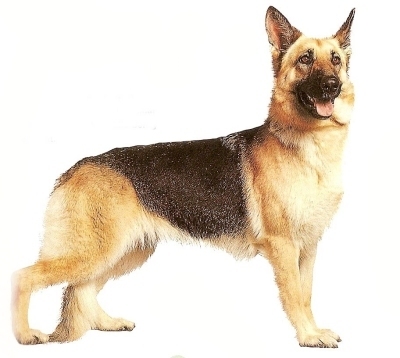 Golden Retrievers come in a close second while German Shepherds come in third. This dog, as the name implies, was originally bred in the Shetland Islands off the northeast coast of Scotland to herd sheep and cattle, which naturally must include the ability to make decisions in an intelligent manner, such as how to bring stray animals back into the pack. This necessarily means that the dog must understand angles, approaches and direction for herding, as well as having an� intuitive sense of understanding of the animals to be herded, as this job involves a high degree of communication. This breed also craves affection and human interaction, which makes sense; if you are smart individual, how much satisfaction can there really be in spending your day with a bunch of sheep and cows. The Shetland Sheepdog was once called the “Toonie”, taken from the word “tun” which is the Norwegian word for farm. 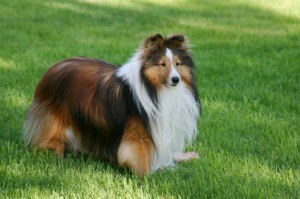 It is believed that the Shetland Sheepdog and the larger herding Collie have a common ancestor, a herding dog bred in the British Highlands, believed to be similar to today’s Border Collie. The dogs that stayed on the Scottish mainland eventually developed into the Rough Collie and those that were taken to the Shetland Isles were downsized to meet the needs of the island and developed into the Shetland Sheepdog. 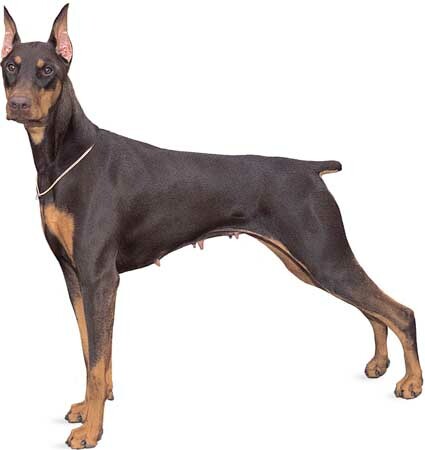 The Doberman Pinscher originated in Germany around 1890 and takes its name for Louis Doberman. Originally it was used almost exclusively as a guard dog. Doberman personalities are characterized by strong sense of loyalty, assertiveness, and fearlessness; they are typically very hard working dogs with a high level of strength and stamina. Their intelligence, along with personal traits, has made them a favorite for jobs that require a disciplined dog that can learn specific instructions to be carried out with precision and reliability. 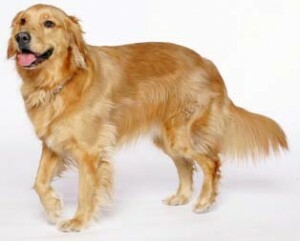 The Golden Retriever originates from Great Britain, and was bred as a water retriever and a hunter. The obedience and intelligence of the breed has now made them popular as guide dogs for the blind. The breed was registered with the American Kennel Club in 1925. Similar to the Labrador, this is a favorite breed for family pets, given its loyalty, patience and love of children. It is both smart and affectionate, learns quickly and its only downside seems to be the long hair, which will certainly leave its mark in the house. The German Shepherd Dog, or Alsatian, is said to be a descendant of the Bronze Age wolf. The modern breed is perhaps the most widely recognized of all dogs, a versatile worker, which is renowned for its strength and agility. 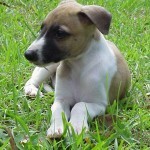 The breed is known as being extremely intelligent and a first-class companion, an obedient worker and loyal guard dog. This breed was known in Europe for at least 400 years, but its true origin is uncertain. 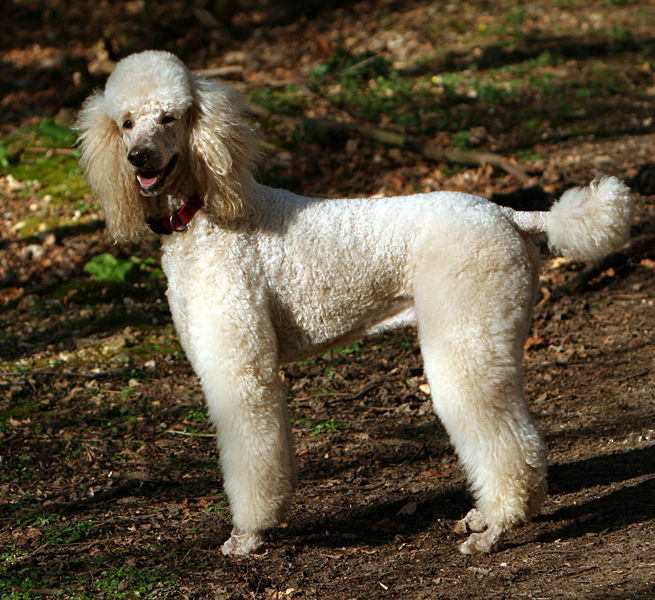 It possibly derived from the Hungarian water dog and the Barbet. France is recognized to be the country of the breed�s origin and is today the national dog of France. Poodles by nature are sensitive dogs who do not like to be left alone. They are usually happy and good natured, very protective of their masters and very social, as they love to be around people. The Border Collie was originally called the “Scotch Sheep Dog” and originated in Northumberland along the borders of Scotland and England. It is a descendant from dogs used by the Vikings to herd reindeer, the old British droving breeds, with spaniel added. 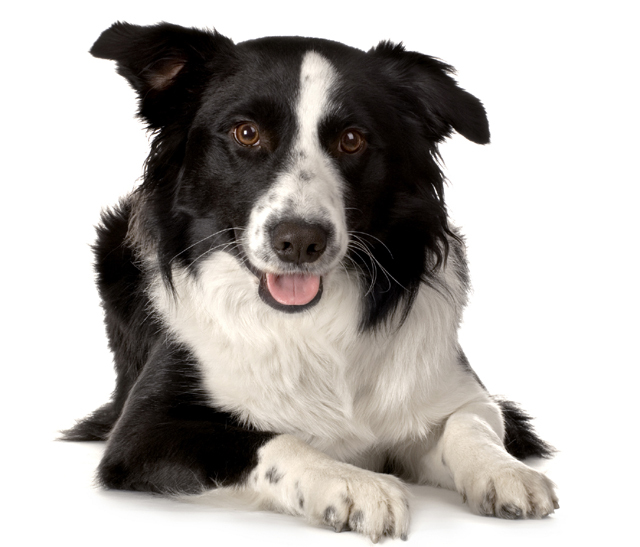 Named a “workaholic” for its shear drive and love for working, the Border Collie has an eye that can hypnotize cattle. It can master any type of herd by crouching down and mesmerizing the animals with its intense stare. One of the most trainable breeds, the Border Collie also serves well as a narcotics and bomb detection dog and is a frequent high performer in obedience, agility, Frisbee trials, police work, search & rescue, Flyball, performing tricks and competitive obedience. It is said that for dog competitions around the world, the Border Collie sets the standard for obedience, speed and agility. In fact Betsy, the world’s smartest dog, is a Border Collie, which is really no coincidence at all. I have a German Shepherd who took half a year to learn the simple command “lie down”, while my other dog, a mix, took two minutes. That proves it has nothing to do with my abilities to train dogs. Reading this list reminds me of my old dog! Thanks for sharing! Great list but where are the Chihuahuas? Nervous yes but smart as whips!